Both the South and North shores of Lake Tahoe sport a variety of gaming options from large, fancy resort casinos, to small informal local hangouts offering 24-hour table games and slots, restaurants, spas and a stream of special events. You want options? Well, Tahoe is a rather unique area for several reasons, one of which is it’s a bi-state lake with the border of California and Nevada running nearly down the middle of the Lake. This provides some of the best of both states. Nevada is known for wild and lavish casinos. Both the South and North shores of Lake Tahoe sport a variety of gaming options from large, fancy resort casinos, to small informal local hangouts offering 24-hour table games and slots, restaurants, spas and a stream of special events. Photos by Hyatt Regency Lake Tahoe , Montbleu , Wikipedia and the Lucky Beaver . 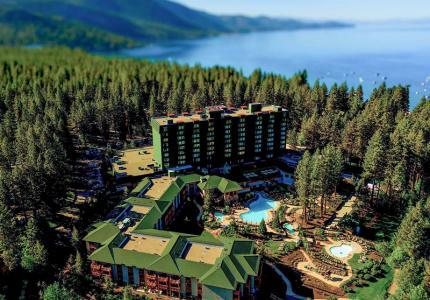 The Hyatt in Incline Village is an elegant and friendly resort casino right on the shores of North Lake Tahoe. The Grand Lodge Casino is smaller than most casinos, but it's intimate and well designed with a mountain theme.The casino features over 250 slots, video poker, 22 blackjack, craps and roulette tables, a live poker room and a full-service sports book bar. Hot Tip: If you are a member of the Hyatt's Player's Club, both slots and table games will give you points for rooms, the spa and the hotel's restaurants. The Montbleu Resort in Stateline continues to be one of the best casinos in the area with a multitude of games, special events, tournaments, bars and restaurants. The casino portion of the resort includes blackjack, craps, roulette and various poker games. Slots and video games include Megabucks, Wheel of Fortune, Ghost Busters and Deuces Wild Poker. The Montbleu also has a Poker Room with live games and daily No-Limit Texas Hold'em tournaments. The Zone Sportsbar & Sportsbook has 40 large screen TVs and plasma screens to watch and bet on the big games. Hot Tip: Order wine or beer when gaming rather than a mixed drink. Harrah's Lake Tahoe in Stateline features everything that the casino is known for including slots and table games, tournaments, promotions and the hottest video poker machines. The table games include baccarate and mini baccarat, blackjack, craps, roulette, poker and Pai Gow poker. The Harrah's Poker Room has ongoing tournaments including daily morning Turbo poker with a $40 buy-in and 1,500 starting chips. Hot Tip: If you game in various cities where Harrah's is located, sign up for their rewards card for points and comps. The Lakeside Inn is known as the local's casino and has some of the friendliest staff in Tahoe. The casino offers slots, table games, a race and sports book and live action poker. Every day, the casino offers promotions and cash rewards. The Lakeside also has special events like Friday Freebies when free play credit is offered in the evenings. Hot Tip: If you don't know much about gaming, the Lakeside has free gaming classes through the University of Lakeside. Also, the Timbers restaurant makes some great food. Harvey's has a partnership with Harrah's and the casinos are connected and shared many of the same games. Harvey's is known for its summer concerts and big name acts, so if you come here to game, stay for their live music acts and bands. Hot Tip: Harvey's is a dog-friendly casino and allows dogs in some of the rooms. As another local favorite, the Crystal Bay Casino is known for its friendly staff, free live music acts and lively Sportsbook. The Crystal Bay Casino offers the newest video slots, table games with friendly dealers and even a smokeless gaming center. Hot Tip: The Crystal Bay Casino's live acts feature local and regional bands and singers. One of the oldest casinos on the lake, the Tahoe Biltmore has over 200 slot and video poker machines, eight table games with blackjack, craps, roulette and a Sports Book. Hot Tip: If you get the munchies while gaming, the Cafe Biltmore serves up some massive pancake stacks. The Carson Valley Inn is located in the Minden/Gardnerville area in the Carson Valley about 45 minutes from South Lake Tahoe. This small, but friendly casino and inn has a great staff, restaurants and table games, slots, live poker, sports betting and promotions in their casino. 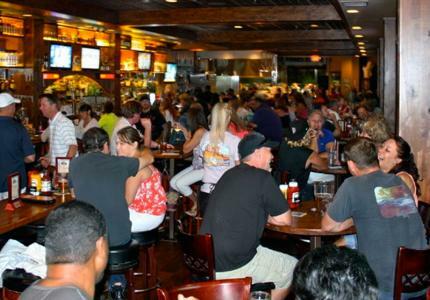 Hot Tip: The Carson Valley Inn is a great place to see big games like the Super Bowl and March Madness. If you want to stay out of the main casinos, but still want a little gaming fun, the Lucky Beaver in South Lake Tahoe is burger restaurant that offers video poker at the bar, slots and a fun lively sports crowd. Their burgers and onion rings are pretty awesome, too. Hot Tip:The Lucky Beaver is a 24-hour sports bar, but only people over 21 are allowed at the bar and restaurant. For an unusual and very Wild West way to game, visit the Oldest Thirst Parlor in Nevada, the Genoa Bar. Located in the small town of Genoa in the Sierra foothills, this bar is rustic, friendly and down to earth. They have a few video poker machines, but come here mostly to chat with the locals and get a cheap beer. Hot Tip: The Genoa Bar's jukebox has a great selection of songs.